Meal Planning Using Google Calendar | The Ultimate Dinner Hack! Frustrated with reinventing the meal planning wheel every week? 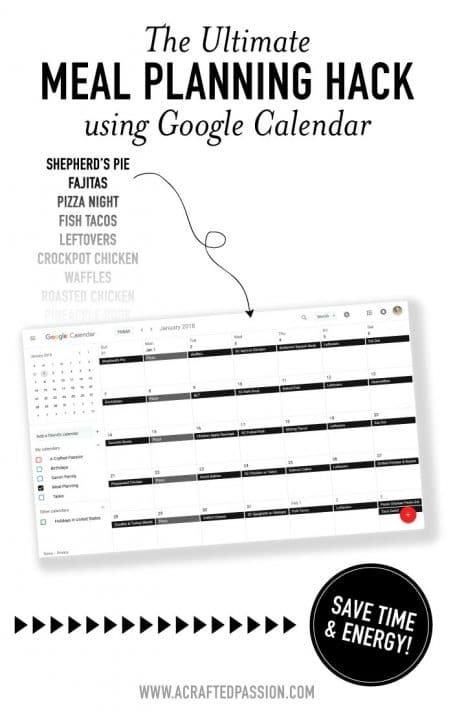 This meal planning hack using Google Calendar saves tons of time and energy by reusing your favorite meals. What mom doesn’t appreciate an easy life hack? After being frustrated with our lack of meal planning systems for months on end I was determined to figure out a sustainable system that worked for us. I don’t know about you, but we tend to eat the same meals over and over again. 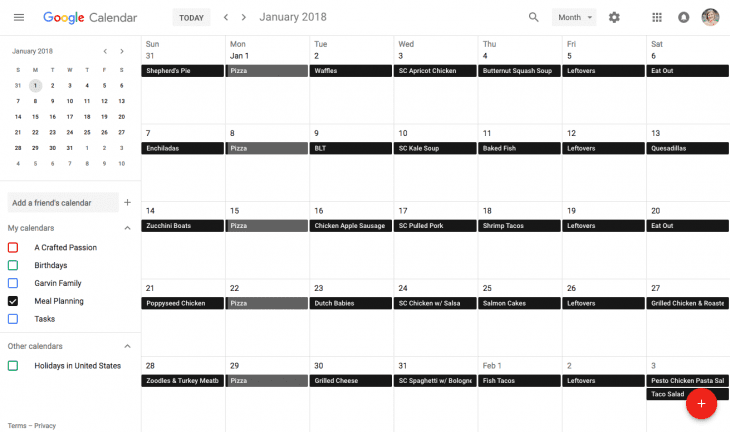 Let me show you how I’ve started meal planning using Google Calendar. I tried meal planning on my paper planner each week. I tried using a magnetic whiteboard on the side of our fridge. I tried sitting down every Sunday night to meal plan for the week, but the task was daunting and annoying and I pushed it off another night and eventually it would be the end of the week and we’d be scrounging for whatever we could find in the cupboards. Time for a serious change! So here’s the system we’ve been using for about six months and has seriously changed our meal planning life. I realize that sounds dramatic, but I’m serious. This saves us so much time and headache and meal planning actually gets done now so quickly and painlessly. Rather than adding one more app or system, how about just use what already works for you. First, let me give you the quick rundown of our system and then I’ll give you some tips on how you can implement it. So the basic idea is you list all your typical dinners as an individual event in Google Calendar one time and then each month you can drag them around to match up with what events you have going that week. On Saturday or Sunday I sit down with my computer and look at both our family calendar and meal planning calendar on Google Calendar. I love that I’m able to see it all in one place. I can then easily just drag the meals around depending on what’s going on during that week. Sunday night is usually a meal that takes a bit longer to make since it’s family day and we have more time to make time-intensive meals or we try out a new recipe. Monday night is pizza night! 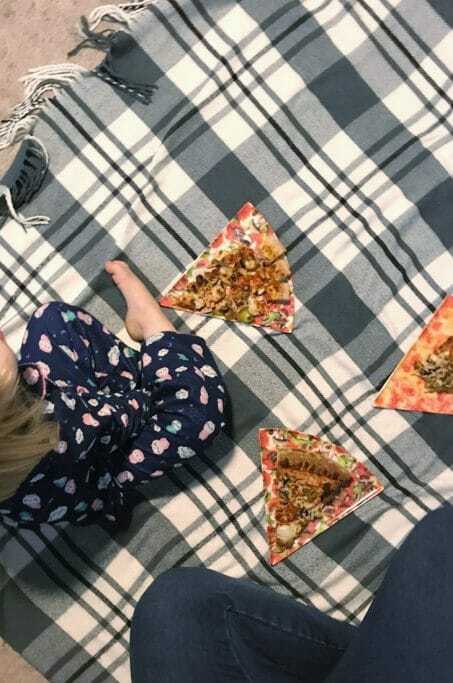 We like to start the work week eating pizza on a blanket in front of the tv. Mondays are always tough with little ones adjusting from the craziness of the weekend, so pizza night has helped take the stress of having to think about dinner. Tuesdays my husband makes breakfast for dinner typically or something easy since I am away every Tuesday night working. Usually my three-year-old requests waffles or dutch babies. We like to have a slow cooker night usually Wednesday or Thursday so I mark all of those meals starting with “SC” so it’s easy to see which ones are slow cooker meals. On Friday night we plan to eat leftovers from the week and then Saturday we typically go out to eat or have something planned outside of the house so do dinner wherever we are. Towards the end of the month, I just drag all the meals down to the next month and rearrange it as needed. Alright, now it is time to get started on your own plan. Sit down with your family and write a list of all the meals you enjoy eating at home for dinner. Shoot for having at least 30 meals to start and then you can adjust it from there realizing that some weeks you might duplicate a meal you had last week. Now, create a new calendar and name it something like Meal Planning. Looking at the month view in that meal planning calendar, click in the calendar and you can easily quick add each meal. It should default to “all-day” (which is what you want). You can also color-code all your meals by category or days of the week to save even more time, but I’ve found it’s just easier for me to move them around based on what we have going on each week. You can set a notification to go off one day prior to each meal reminding you what tomorrow’s meal is in case you need to pull anything out of the freezer or grab any last minute items. When it’s time to meal plan, you can just easily drag the meals around to fit your week. I’ve found it’s easiest to look at my schedule for the week on Sunday night, order online groceries through Clicklist, and then we’re set for the week. Online grocery shopping is a busy mom’s best friend! We do it every week and it’s a serious game-changer! No more pushing off grocery shopping because I don’t want to haul two little ones around the grocery store or finding time in the busy evening for one of us to run to the store to shop kidless. It’s seriously the best! Drive up, call the number, within a few minutes they load your groceries into your trunk. The tasks tab in Google Calendar is super handy to add breakfast, lunch, and snack ideas. 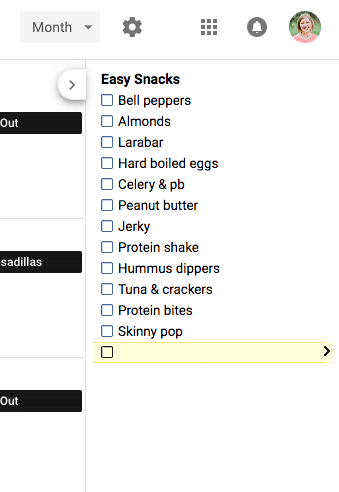 If you’re struggling on what to eat the rest of the day you can just pull that up and have a list of healthy snack ideas. So, what do you think? Do you meal plan? I’d love to hear what system works for you.